Part 1 Commodity biomaterials: Membranes for oxygenators and plasmafilters: Titanium and cobalt-chromium alloys for hips and knees; Polymeric joint bearing surfaces for total joint replacements; Biomaterials for pacemakers, defibrillators and neurostimulators; Mechanical and bioprosthetic valves. Part 2 Advanced and next generation biomaterials: Small intestinal submucosa and other decullarized matrix biomaterials for tissue repair; New ceramics and composites for joint replacement surgery; Biomaterials for improving the blood and tissue compatibility of Total Artificial Hearts (TAH) and Ventricular Assist Devices (VAD); Nanostructured biomaterials for artificial tissues and organs; Matrices for tissue engineering and regenerative medicine. The worldwide demand for organ transplants far exceeds available donor organs. Consequently some patients die whilst waiting for a transplant. Synthetic alternatives are therefore imperative to improve the quality of, and in some cases, save people’s lives. Advances in biomaterials have generated a range of materials and devices for use either outside the body or through implantation to replace or assist functions which may have been lost through disease or injury. 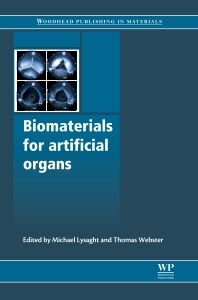 Biomaterials for artificial organs reviews the latest developments in biomaterials and investigates how they can be used to improve the quality and efficiency of artificial organs. Part one discusses commodity biomaterials including membranes for oxygenators and plasmafilters, titanium and cobalt chromium alloys for hips and knees, polymeric joint-bearing surfaces for total joint replacements, biomaterials for pacemakers, defibrillators and neurostimulators and mechanical and bioprosthetic heart valves. Part two goes on to investigate advanced and next generation biomaterials including small intestinal submucosa and other decullarized matrix biomaterials for tissue repair, new ceramics and composites for joint replacement surgery, biomaterials for improving the blood and tissue compatibility of total artificial hearts (TAH) and ventricular assist devices (VAD), nanostructured biomaterials for artificial tissues and organs and matrices for tissue engineering and regenerative medicine. With its distinguished editors and international team of contributors Biomaterials for artificial organs is an invaluable resource to researchers, scientists and academics concerned with the advancement of artificial organs. Dr. Michael Lysaght was the Founder and Director Emeritus of Brown University, USA’s Center for Biomedical Engineering, and a retired member of the Brown Faculty. He sadly passed away before he could see this finished book and remains a widely recognized and well-respected figure in the field of biomedical engineering for his contributions to organ replacement technology.